Le Creuset makes a wide variety of well-crafted kitchenware -- from its iconic enameled cast iron casseroles and “French ovens,” to stoneware baking pans and au gratins, to stainless steel sauce and saute pans. 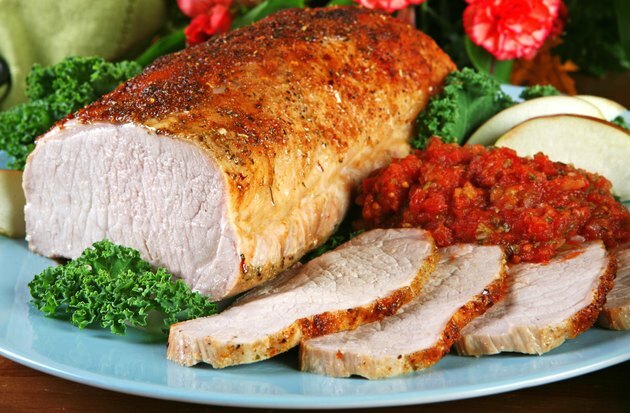 Pork loins, sold in 3- to 5-pound boneless roasts and 1 1/2- to 2-pound tenderloins, require a baker or casserole with shallow sides. Roast low-fat, protein-rich pork loin uncovered in your Le Creuset bakeware. Preheat your oven to 325 degrees Fahrenheit. Rub the bottom of your Le Creuset pan with a tablespoon of cooking oil. Remove the tenderloin from its packaging. Packages may contain marinade; you may remove it by rinsing the meat in water -- marinades contain extra salt -- or use it in the cooking dish. Place the roast in the pot and add seasoning such as salt, pepper, rosemary or garlic, if desired, to plain pork. Add up to a cup of chicken broth or water to the bottom the pan. Le Creuset pans are not engineered to dry roast -- meats must be braised. Roast the loin roast for about 30 minutes per pound -- 45 minutes total for a tenderloin -- until the pork reaches an internal temperature of 155 F. Le Creuset pans heat very evenly, so begin checking meat temperature about halfway through heating to find out how fast the roast is cooking. Replace any liquid that escapes as steam when you open the oven door. Remove the roast and cover it with aluminum foil in the cooking pan to allow the roast to rest for about 10 minutes. Alternately, cover a casserole with its lid. During this period, the roast will continue to cook, bringing it to a serving temperature of 160 to 165 F.
Set a roast, seasoned with caraway, on a bed of sauerkraut -- or stuff the roast with apples for a fall treat. Tenderloins can also be roasted at 425 F for about 15 minutes; Le Creuset bakeware is safe to use in ovens up to 500 F.
Always wear oven gloves to handle hot bakeware, and use trivets or pads to insulate countertops or wood surfaces.